The court granted in part the parties' motions in limine to preclude publicity which praises a party or its products. "Apple will not be permitted to present media articles or equivalent publicity praising features of the iPhone or iPad (or the Apple company, Steve Jobs, or Apple products in general) unless they mention (or can be shown to be referring to) claim elements that Apple alleges Motorola infringes or that Motorola argues were anticipated or obvious and that are actually in dispute. If the articles or other publicity do not praise an element in suit, they are irrelevant to any legal issue in the case, and can only confuse the jury. . . . More broadly, I forbid Apple to insinuate to the jury that this case is a popularity contest and that jurors should be predisposed to render a verdict for Apple if they like Apple products or the Apple company or admire Steve Jobs, or if they dislike Motorola or Google. The overall quality of the products involved in the litigation is irrelevant to the legal issues. This prohibition applies mutatis mutandis to Motorola . . ."
Apple, Inc. v. Motorola, Inc., et. al., 1-11-cv-08540 (ILND May 25, 2012, Order) (Posner, C.J.). The court granted in part plaintiff's motion for attorneys' fees under 35 U.S.C. § 285 following a jury trial where defendants engaged in bad faith litigation tactics. "Plaintiff contends that Defendants’ litigation tactics reflect an effort to intimidate Plaintiff so that he would not pursue his lawful patent claims. Defendants allegedly attempted to do so by asserting that they would 'not let go of this case' until Plaintiff paid Defendants their attorney’s fees. . . . These settlement offers, combined with intimidating language, are evidence of bad faith litigation tactics. Thus, this evidence supports an award of attorney’s fees." Jake Lee v. Mike's Novelties, Inc., et. al., 2-10-cv-02225 (CACD May 22, 2012, Order) (Kronstadt, J.). The court excluded the opinions of plaintiff's damages expert as to a reasonable royalty for plaintiff's real-time display patent because the expert based his analysis on information obtained from plaintiff's principal technical expert. "Suppose [the damages expert] had been hired by [defendant] to advise on how at lowest cost [defendant] might obtain the functionality of [the asserted patent at issue] without infringing that patent. Obviously [the damages expert] would not have gone to the patentee for that information! For it would be in the patentee’s interest to suggest a method of inventing around that was extremely costly, because the costlier the invent-around, the higher the ceiling on a reasonable royalty. . . . So. . . imagine this imaginary conversation between [plaintiff's damages expert] and [defendant], which I’ll pretend hired [the damages expert] to advise on how at lowest cost to duplicate the patent’s functionality without infringement: [Defendant]: 'What will it cost us to invent around, for that will place a ceiling on the royalty we’ll pay [plaintiff]?' [Expert]: 'Brace yourself: $35 million greenbacks.' [Defendant]: 'That sounds high; where did you get the figure?' [Expert]: 'I asked an engineer who works for [plaintiff].' [Defendant]: 'Dummkopf! You’re fired.'" Apple, Inc. v. Motorola, Inc., et. al., 1-11-cv-08540 (ILND May 22, 2012, Order) (Posner, C.J.). Following an evidentiary hearing, the ALJ rejected respondent's RAND, implied license, and equitable estoppel defenses. "[W]ith all the patents subject to RAND licensing obligations that may have ever come before the Commission, [respondent] was not able to cite one case in which a section 337 remedy was foreclosed due to the existence of RAND obligations. . . . [Respondent] has cited to no instance in which an executed document such as a letter of assurance sent to an SSO resulted in an implied license. . . . [T]he documents sent to the SSOs by [complainant] explicitly state that no license should be implied. Moreover, the evidence indicates that [complainant] has licensed its patents, including those deemed to be essential to SSO standards, only after negotiations. . . . [Respondent] never explains . . . that it undertook [investment costs] in consideration of [complainant's] communications with the SSOs in which it assumed RAND obligations. [Complainant's] communications to the SSOs may have been misleading . . . but there is no evidence [respondent] relied on any statement by [complainant] to embark on, or continue in, any course of conduct." Gaming and Entertainment Consoles, Related Software, and Components Thereof, 337-TA-752 (ITC May 10, 2012, Order) (Shaw, ALJ). The court dismissed for failure to state a claim plaintiff's claim that defendants and end users of Google Voice (an internet telephone service) jointly infringed plaintiff's internet telephone method patent. "Plaintiff contends that the [patent-in-suit] was infringed by multiple parties acting at the direction of cell phone users. . . . Without pleading 'control or direction,' [plaintiff] has not set forth a plausible claim for joint patent infringement. . . . [Plaintiff] alleges that cell phone users enter into subscription agreements with [defendant]. The Plaintiff does not, however, allege that these agreements 'contractually obligate' [defendant] to connect [the accused system's] calls using the [a platform] interface. . . . Indeed . . . [plaintiff] specifically alleges that '[defendant] reserves the right to restrict calls or connections to any telephone in its sole discretion.' . . . Thus, viewing the allegations in the light most favorable to the Plaintiff, [it] has not alleged that cell phone users direct or control the allegedly infringing method." Selex Communications, Inc. v. Google, Inc., 1-09-cv-02927 (GAND May 11, 2012, Order) (Thrash, J.). The court granted plaintiff’s motion to reconsider an earlier order directing plaintiff to produce all documents on its privilege log. However, upon reconsideration, the court rejected plaintiff’s assertion of a purported “settlement negotiation privilege derived from Federal Rule of Evidence 408.” “[N]ew federal privileges are not to be created by the courts lightly. Liberal discovery is the general rule. More and more exceptions to this general rule threaten to swallow it. This case, in particular, illustrates the danger of creating new privileges. Both parties here have repeatedly engaged in disingenuous invocation of privileges and exceptions in a show of blatant gamesmanship, abusing the rules of discovery in either an attempt to create delay or to avoid surrendering evidence they know full well should be turned over. They don’t need yet another tool by which to abuse the system. The Court finds no discovery privilege exists regarding settlement negotiations. Admissibility, of course, is an entirely different matter. But if [plaintiff] continues to withhold these documents, it must do so on a basis other than settlement 'privilege.'" Pactiv Corporation v. Multisorb Technologies, Inc. et al, 1-10-cv-00461 (ILND May 18, 2012, Order) (Leinenweber, J.). The court granted plaintiff’s motion for entry of a preliminary injunction enjoining defendant from manufacturing, marketing, and selling its accused products, finding that plaintiff was likely to suffer irreparable harm due to defendant’s infringement of plaintiff’s soil stabilizer patents. “[Plaintiff] is likely to suffer irreparable harm if [defendant] continues selling an infringing product, produced by infringing methods. . . . I am convinced that due to the price erosion of the product, combined with [plaintiff’s] size, [plaintiff] would suffer irreparable harm. . . . [Defendant’s] product is a copycat that appears to have pirated [plaintiff’s] patented technology and product formulation. This gave [defendant] the advantage of selling the same technology and product without investing in research, development, intellectual property, or market development efforts. Thus, [defendant] is able to offer its product to the market at a lower price than [plaintiff]. In contrast, [plaintiff] is seeking to recoup its investments through sales of its [patented] products. . . . I am thus convinced that [plaintiff] will suffer irreparable harm if [defendant] is continued to allow to sell its copycat product." The court granted defendants' motion to dismiss plaintiff's indirect infringement claims for failure to state a claim where plaintiff did not identify the nonparties who infringed. "Plaintiff’s allegations of indirect infringement do not . . . identify the parties other than the named defendants that directly infringe. Rather, Plaintiff only alleges that the named defendants 'have contributed to or induced, and continued to contribute to or induce, others to infringe the [patent-in-suit].' . . . While Form 18 does not set a high bar for what must be alleged, Plaintiff has not met that bar. The Court has high expectations of a plaintiff’s preparedness before it brings suit. Thus, the Court expects that Plaintiff already has sufficient knowledge of facts that it can include in its complaint that would give the named defendants sufficient notice of the indirect infringement claims alleged against them. The Court does not require in a complaint the specificity that P.R. 3-1 requires, as that would go far beyond Rule 8's and Form 18's requirements, but some greater specificity is required here." Docket Navigator maintains a library of more than 2,800 scheduling orders and modifications to scheduling orders filed in patent cases. Do you need to know a judge’s typical schedule (e.g., time for fact and expert discovery, claim construction schedule, dispositive motion practice, time to trial, etc.)? Click here, then choose a judge from the Judge filter located on the left margin. The court rejected the parties' proposed modifications to the scheduling order and entered its own amended scheduling order. "[The parties'] proposed scheduling order is the most complicated ever seen around these parts. It boggles the mind; it makes the head swim. Furthermore, it contains language which is foreign to any order issued by this Court, past or present. . . . Examples include: 'motion for summary judgment of indefiniteness' (not nearly definite enough); 'joint pretrial order' (deleted from our local rules more than ten years ago); 'motions in limine' (not favored in this Court and rarely, if ever, granted)." The court denied plaintiff's motion for summary judgment that defendant's claims regarding its remote control patents were barred by implied waiver. "[Plaintiff] points to no law dictating that silence outside of the SSO [Standard Setting Organization] context is 'so inconsistent' with intent to enforce. In light of other courts imposing significant barriers to establish a duty to disclose in the SSO context and thus waiver, the Court finds no reason to find the alleged facts here establish a duty outside the SSO context. Nor does the Court find the conduct taken as a whole to be 'so inconsistent' as to constitute a waiver as a matter of law." The court granted defendants' motion for summary judgment of invalidity of plaintiffs' Boniva® drug patent for obviousness. "Applying [KSR Int’l Co. v. Teleflex Inc., 127 S. Ct. 1727 (2007)] to the instant case leads to the conclusion that demonstrating that it was obvious to try once-monthly oral administration of ibandronate at doses of 75 mg and 150 mg is legally sufficient to prove obviousness. There is no dispute that, [10 years ago], there was market pressure to solve the problem of finding an osteoporosis treatment with reduced gastrointestinal side effects and improved patient compliance. . . . [T]he combination of [a prior art article and two prior art research reports] suggests two possible treatments: once-monthly oral administration of ibandronate at doses of 75 mg and 150 mg. The set of these two options contains a finite number of identified solutions. . . . The evidence shows that there was good reason to expect success with these two solutions, because they are straightforward applications of the total dose concept proven by [one research report] to the research findings of [the other research report], and the selection of a once-monthly dose equivalent to the 5 mg daily dose is supported by the recommendation of a 35 mg weekly dose in [a prior art patent]." The court denied plaintiffs' motion for summary judgment of noninfringement of defendants' stun gun design patents and rejected plaintiff's argument that listings on its online marketplace were not offers-for-sale by plaintiff that could trigger direct infringement liability. "Determining whether there has been an offer-for-sale in the context of patent law requires the application of traditional contract law principles to the particular case. . . . There is no controlling decision as to whether an online marketplace, such as [plaintiff's] websites, can be liable for direct patent infringement. Under an application of traditional contract law, the relevant inquiry is whether a person shopping on [plaintiff's] websites would have reasonably believed that [plaintiff], and not third-party sellers, was the seller with title or possession of a product who could have entered into a contract to transfer title or possession. There is a factual dispute as to whether a reasonable buyer going on [plaintiff's website] would have believed that [plaintiff] itself was making an offer to sell the allegedly infringing products. The name of the 'supplier' is only in small font. Moreover, 'supplier' may be interpreted to mean manufacturer but that [plaintiff] is owner of the products." Which types of harm are sufficiently “irreparable” to support issuance of a TRO or preliminary injunction? If you need a password to access the link (or any other link in the Docket Report), contact us at trial@docketnavigator.com. It’s included in your subscription! The magistrate judge recommended granting plaintiff’s motion for a preliminary injunction regarding plaintiff’s enclosure patent where plaintiff established irreparable harm. "Plaintiff’s owner and co-inventor of [its product] averred that because of its loss of market share, Plaintiff faces a shutdown of [that] product line and perhaps other product lines. Further, without an injunction, Plaintiff has demonstrated it will lose at least one exclusive licensing deal, if not other contracts and sales. Additionally, a financial advisor for Plaintiff submitted an affidavit averring that '[b]ecause of the commercialization of [Defendants’] competing and allegedly infringing product, the value and marketability of [Plaintiff’s] business and product line is being reduced by an unknown amount.' Therefore, based on the record before the Court, the Court concludes Plaintiff has adequately demonstrated that, without an injunction, it will likely suffer irreparable harm." The court sua sponte struck the parties’ joint claim construction filings, because the number of claim terms that the parties submitted for construction exceeded the limit set by the court, and no party moved to raise the limit on the number of terms to be construed. “At the parties’ February 28, 2011 Scheduling Conference, the Court stated that it would construe no more than 12 claim terms, except upon noticed motion requesting construction of additional terms. … In the fourteen months since that Scheduling Conference, no party filed a motion to raise the claim construction limit. Instead, the parties filed a ‘Joint Claim Construction and Prehearing Statement’ on May 2, 2012 requesting that the Court construe forty-five claim terms from eight different patents. Because of the parties’ noncompliance with the Court’s instructions, the Court strikes the Joint Claim Construction and Prehearing Statement. The parties shall submit a revised Joint Claim Construction and Prehearing Statement . . . identifying no more than 12 claim terms for this Court to construe. Alternatively, each party may separately lodge . . . a document setting forth the 12 terms it wishes construed in order of preference. If the parties submit separate documents . . . , the Court will review them to determine if both sides desire construction of the same terms. If so, the Court will construe them. If, as is likely, there is not perfect overlap between the parties’ chosen terms, the Court will select the remainder by going down each party’s list – selecting the first term from Plaintiff’s list, followed by the first term from Defendant’s list, followed by the second term from Plaintiff’s list, followed by the second term from Defendant’s list, and so on – until the 12 term limit is reached." Following a bench trial, the court found that the first of plaintiff’s two asserted patents, covering the composition of a pharmaceutical compound (dexmedetomidine hydrochloride), was not unenforceable due to inequitable conduct, because defendants failed to carry their burden in demonstrating a specific intent to deceive the PTO. "Defendants simply assume that because [an inventor] was in some supervisory capacity that he would have been aware of [data supporting defendant's inequitable conduct claim]. But such an assumption is insufficient to demonstrate clear and convincing evidence of intent that [the inventor] therefore deliberately withheld the data. Nor will the Court attribute specific intent to [the inventor] simply by virtue of his signature on a 100-page report that contained the [data] on page 61. . . . [The inventor] could not recall whether he or anyone else submitted the [data] to [his company's patent department]. [The inventor's] lack of memory is frustrating, but it cannot be used to demonstrate specific intent to deceive. That is a jump in reasoning the Court is unwilling to and cannot make." The court denied defendants' motions to dismiss plaintiff's indirect infringement claim for failure to state a claim. "Defendants argue that a specific third party must be identified. . . . [T]he Court disagrees. . . . As Plaintiff points out, exact specificity of the third party is not required at the trial level, let alone at the pleading stage. In [Lucent Techs., Inc. v. Gateway, Inc., 580 F.3d 1301 (Fed. Cir. 2009)], the Federal Circuit allowed a jury verdict finding inducement of infringement and contributory infringement to stand where no single third party infringer had been identified. . . . The Court notes that case involved a product that was capable of being used in a non-infringing manner, and so the inference that someone used it in an infringing manner is an even greater leap than what is alleged here, that no non-infringing use is possible. Plaintiff has alleged Defendants’ customers have downloaded the app and that they have 'operate[d]' them on their phones. That suffices." The court granted the patentholder's motion to transfer fourteen actions in three districts to the MDL in the District of Delaware despite defendants' argument that the America Invents Act precluded the MDL panel from centralizing the actions. "[T]he America Invents Act does not alter our authority to order pretrial centralization of this litigation. First, transfer under [28 U.S.C.] Section 1407 and joinder under [the America Invents Act] operate under decidedly different standards. . . . Transfer under Section 1407 does not transmute all transferred actions into a single action, thereby joining all defendants. Instead, the separate nature of actions transferred to an MDL is preserved throughout each action’s pendency whether the actions proceed in a coordinated or consolidated manner. . . . Moreover, [defendant] does not point to any portion of the legislative history of the America Invents Act joinder provision that discusses pretrial transfer under Section 1407." The court granted plaintiff's motion to compel defendants to produce settlement agreements regarding technology comparable to, but not covered by, the patents-in-suit, but denied the motion with respect to communications leading to those settlements. 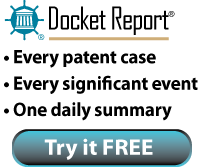 "While the Court agrees with [plaintiff] that [defendants'] VOIP patent licenses and settlement agreements are relevant to the determination of reasonable royalty calculation under the second and twelfth Georgia-Pacific factors, [plaintiff] has not adequately shown how [defendants'] settlement communications with. . . VOIP patent litigation defendants that led up to the VOIP patent licenses or agreements would be relevant. Although the Court previously found. . . that licensing communications between [plaintiff] and other third parties were relevant, those licensing communications were pertaining to the patents-in-suit rather than to comparable patents as sought here." Touch Screen Device "Finger Tap" is not Equivalent of "Finger Swipe"
The court granted in part defendant's motion for summary judgment of noninfringement of plaintiff's touch screen interface patent and rejected plaintiff's argument that a finger swipe was the equivalent of a finger tap. "[T]ouch screen devices are often programmed so that the two gestures can both perform the same next-item command. That does not make them equivalent. . . . If consumers distinguish between the two, they are not interchangeable; if they were interchangeable, programmers would be content to use one or the other method rather than providing a choice. Equivalence refers to a situation in which, in an effort to avoid liability for infringement without making a substantive change in a patented product, the alleged infringer makes a trivial change that neither lowers a producer’s costs or alters the consumer’s experience. . . . [Plaintiff's] final equivalents argument is that 'a tap is a zero-length swipe.' That’s silly. It’s like saying that a point is a zero-length line."